In The Happiness Advantage, Shawn Achor discusses the relatively new field of positive psychology - which is the scientific study of how people become happier (or thrive). In the book, he translates many scientific findings into usable techniques the reader can apply to his/her own life in order to get happier. (1) Happiness precedes achievement - Among the most significant ideas in The Happiness Advantage is that our usual conception of what leads to happiness is backwards. We normally think that if we work hard and achieve something of significance, then we will become happier as a result. He thinks the opposite is more the case. Once we change our attitudes to become happier - and to a great extent because of this positive attitude - we achieve a lot. We become happier first and this leads to the greater achievement. He cites a number of studies which support this view. (2) Change your perspective about your work and potential - Achor proceeds in this section to review the many ways in which our perspectives can change and how that change in perspective affects our performance. His main point is that we should stop thinking of ourselves and of the world as ‘fixed’ in potential. People who expect a lot of themselves end up achieving more - even if they start with the same basic ability as others. Those who believe that intelligence isn’t something that is ‘fixed’ also end up achieving more. Since we rarely know our actual long-term potential, the best approach, he argues, is to maintain an open mind and a positive outlook on our own potential. He further examines the benefits of imbuing meaning into your work. Those who think even of rote work as meaningful (purposeful) benefit in terms of their own happiness and in terms of how well they perform the job. (Thus, the janitor can be inspired to come to work while the surgeon thinks of his work as a drudgery). People who think of what they do as only a job - end up wanting only a paycheck and are less intrinsically satisfied with what they do. Those who view it as a career are more invested in their work and enjoy the process a little more. Those who view what they do as a calling view themselves as contributing to a greater good and find meaning and purpose in their work. People with a calling end up working harder and longer and more enjoyably than those in the other categories. (5) If you get overwhelmed - narrow your circle of concern - In The Happiness Advantage, the author notes that those who feel in control of their world and environment end up having reduced stress and a sense of well being. If you learn to narrow your concerns - in times of stress or if you are overwhelmed - to a ‘smaller circle’ then you can set up achievable goals and enjoy the process more because you are in control of it. He advizes people first to be sensitive to exactly what the problem is - why are you feeling overwhelmed? What is causing the excess stress? Then, learn which things you can control and which you cannot. Don’t worry about those things you cannot control. Finally - set up small achievable goals within this framework. Once you feel more in control, you can gradually widen your circle of concern, expanding your goals as your confidence improves. (6) How to inculcate good habits - Generally Anchor believes that the more involved and active our activities - the happier we become. He relates how simultaneously easy and difficult it is to create new, active habits. It is easy, in the sense that, the more you do something the more it becomes a habit. That is pretty simple. On the other hand, he notes that we usually have a hard time mustering the energy to start new things and to incorporate them into our lives. For example, even if the author intends getting off the couch and practicing his guitar - it is so easy for him to simply continue sitting on the couch and to grab the remote control. There is a certain built-in barrier (the desire to relax) that takes over until IT becomes the habit (people who sit on a couch for hours end up reinforcing that habit, even if it doesn’t make them very happy long term). His technique is to lower the energy barrier you need to muster in order to do things that are in fact more rewarding than watching TV. So, for example, the author put his guitar right within easy reach of the couch - and also took the batteries out of his remote control. In this way the easier thing for him to do was to start practicing the guitar, which is the habit he was trying to establish. To motivate himself to run in the morning the author actually went to sleep the previous evening in his running clothes so that there would be very little to do (put on his running shoes in the morning) in order get out the door and start running. He encourages us all to modify our environments so that the active habits we want to obtain are very easy to start and the things we don’t want to encourage are associated with a high ‘activation burden’ in order to get started. (7) Create positive social relationships for multiple benefits. In The Happiness Advantage, Anchor points out that there is a fundamental desire to be connected to those around us. Anxiety is reduced and sense of well-being increased with positive social relations. He notes the numerous positives associated with encouraging these relationships with family, co-workers, and friends. The effect is to lead to more cohesive and productive teams at work and to allow people to enjoy their work more and to feel more invested in the job. Relationships with the boss or CEO of a company are also very important for each employee and affect greatly a person’s commitment to the company and tendency to stay there. People with lots of social relationships have a safety net built into their lives that helps them in bad times. Friends and friendly people also share psychological, material, and informational resources. The health and achievement of those with many positive social relationships is also much higher. Given the importance of all these relationships the author reviews multiple large and small techniques for encouraging positive relationships among family, friends, and co-workers. (1) One surprising aspect of The Happiness Advantage is the lack of a clear definition for happiness. At one point he refers to ‘a subjective feeling of well-being’. But he discusses multiple definitions and doesn’t really settle on any one of them, although he seems ultimately to like Aristotle’s ‘eudaimonea’ which is generally translated as ‘human flourishing’. I think for a book which attempts to be scientific - this lack of a clear definition is surprising. 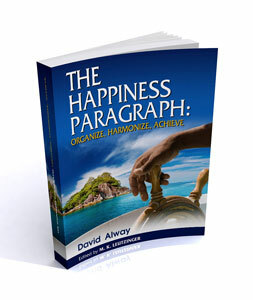 (2) A major thesis in The Happiness Advantage is that happiness precedes achievement , not the other way around. As stated, I don’t exactly agree with this because I think the formulation is misleading. First of all, the formulation assumes the two options are mutually exclusive. Either hard work and achievement lead to happiness - or the other way around. It seems to me though that the two feed off each other. You can be happy because of what you achieve or are in the process of achieving. Also - having achieved something and gotten happier - you can then have more confidence and be happier and expect to succeed in the future - and therefore do better at your next task. There simply is no reason to have to choose one or the other direction of causality. (3) But more fundamental to this - he doesn’t really mean what he says. While the author speaks of happiness in discussing causality - he is actually talking about having an expectation of success. For example, if you go into something with the feeling that you could succeed, or expect yourself to do well, then you in fact end up doing better than you would without this attitude. This attitude, though, is not exactly happiness, it is rather a set of positive beliefs about your chances of success. These beliefs can be summarized with the following types of statements: I think that if I work hard, I can achieve a lot. I think I can learn new things and continually do better in life. Intelligence is not a fixed limit - I can improve it, or, it is not a limiting factor for my achievements. I can be very determined and overcome obstacles if I need to. No one really knows how much I can achieve - not even myself. These beliefs are similar to Ayn Rand’s ‘benevolent universe premise’. So while the author makes great points about the benefits of this positive attitude, he does a disservice to our understanding of causality by calling it happiness. (4) Given the overall size of the book, The Happiness Advantage provides insufficient emphasis on meaning and purpose in one’s life. In principle #2 he talks about people have a job, or a career, or a calling - and clearly implies that having a calling as the most appealing choice - but just leaves it there. There isn’t much advice regarding how to find your calling or whether you should make this the central organizing principle of your life (as I would say you should). The Happiness Advantage is an excellent introduction to the field of positive psychology and contains well-researched principles for achieving happiness. It does have some minor shortcomings regarding a poor definition of happiness and some minor confusion regarding one of his major principles. Additionally, the author insufficiently emphasises having a major purpose. Overall I would recommend this book highly for understanding how to be happier.